Sunlands Online Education (STG) intends to raise $163 million in a U.S. IPO of its ADSs representing Class A shares. The company is a prominent post-secondary and professional education firm in China. STG is asking for a high valuation at IPO and has not demonstrated a path to profitability. Beijing, China-based Sunlands was founded in 2003 as a traditional offline education company, but it made the switch to digital in 2014. The firm counted 407,960 students as of June 30, 2017, and says it is the No.1 provider of postsecondary and professional education in China. Management is headed by CEO Tongbo Liu, who has been with the firm since 2009 and was appointed to the CEO position in January 2015. The companys founder, Peng Ou, is Chairman of the Board. Post-IPO, Mr. Ou will remain the sole controlling shareholder of the company. Other principal shareholders include Studyvip Online Education (33.4% pre-IPO shareholder), PV Pluto Ltd. (13.2%), Marble Faith Ltd. (10.2%), Studyvip E-learning (9.1%), Elite Concept Holdings (8.5%) and SCuPt Global (5.7%). Sunlands has created an online tutoring system that provides flexibility and increased chances of passing degree program tests in the postsecondary markets within China. The firm provides a wide range of test preparation courses, from community college level to professional designations such CPA exams to full MBA curriculums. Sunlands appears to focus its offerings on the lower end STE market, or Self-taught Higher Education Examinations, which covers 18 majors. STG acquires its students through search engine marketing, mobile marketing andoffline channels. The firm has a significant direct sales force and adopts a counseling-oriented sales marketing approach that seeks to offer our education solutions to meet their [students] needs based on their education background and goals… In addition, our enrollment consultants also help them formulate effective study plans throughout their enrollments in our courses. So, the firms STE focus may operate as an on-ramp of sorts for its higher education and professional programs. STG also offers various financial services to students to enable them to afford the course curricula of their choice. Sunland’s contracts with third-party loan companies to provide it with payment for loans that it arranges on students behalf. The firm recognizes expenses associated with customer acquisition within its Sales and marketing expenses line item. Its Sales and marketing expenses as compared to revenues was 136% in the first six months of 2017 vs. 124% for the same period in 2016. 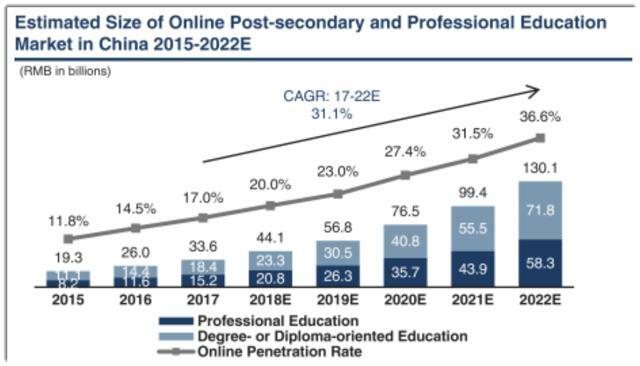 While third-party figures for the online post-secondary education market in China are difficult to find, the overall online education market is growing substantially. A 2017 article by Bloomberg highlighted the lucrative business of Chinas private education market. A number of companies have gone public in Hong Kong as well as in the U.S. (REDU) (RYB). Sunlands cited an iResearch report (that Sunlands commissioned) indicating significant growth in the size of its part of the online education market. I could not independently confirm these growth figures. Additionally, a CAGR of 31.1% for a six-year period is quite high. It likely assumes continued uninterrupted economic growth and may not take into account the concerted effort by the Chinese government to rein in consumer lending practices, which may impact the financial operations of firms such as Sunlands. The firm faces competition from offline providers of post-secondary education as well as online providers. In addition, online education providers that offer services to younger grade levels present an indirect threat, as their platforms are already optimized for online learning and their business models need only be expanded to extend into Sunlands market space. Management also states that it faces intense price competition from all forms of competition, thereby reducing pricing power and revenue growth prospects. Given STGs topline revenue growth rates, it is highly likely it will attract online learning competitors shortly. 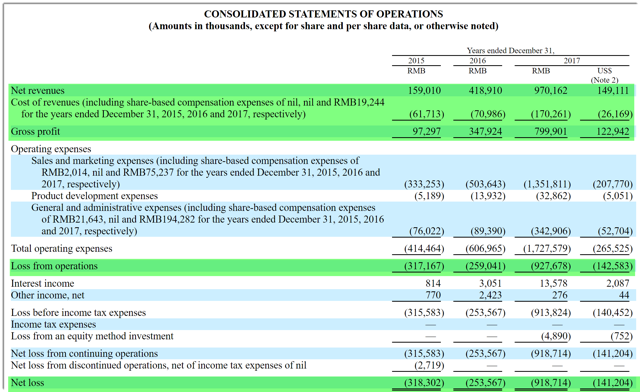 As of December 31, 2017, the company had $140.3 million in cash & short-term investments and $397.6 million in total liabilities. STG intends to sell 13 million ADSs at a midpoint price of $12.50 per share for gross proceeds of approximately $163 million. Each 25 ADSs represent one Class A ordinary share. The firm also has Class B and Class C shares, which entitle the holders to seven votes and ten votes per share, respectively. Multiple share classes serve to entrench management and existing shareholders with voting control separate from economic ownership. The S&P 500 Index no longer admits firms that have multiple share classes into its index. Two investors have agreed to purchase a total of $40 million of Class A shares at the IPO price. This is a positive signal and is uncommon for non-life science IPOs. Assuming a successful IPO, the companys post-IPO market capitalization would be approximately $2.17 billion. [i] approximately 20% of the net proceeds for our course and educational content development, [ii] approximately 40% of the net proceeds for our research and development relating to our IT systems, [iii] approximately 10% of the net proceeds for our marketing and branding activities, [iv] approximately 10% of the net proceeds for potential selective investment and acquisition opportunities, and [v] approximately 20% of the net proceeds for general corporate purpose. Listed bookrunners of the IPO are Goldman Sachs [Asia], J.P. Morgan, Credit Suisse and CLSA. An enhanced version of this article including valuation and commentary on the IPO is available on my Seeking Alpha Marketplace research service, IPO Edge. I write in-depth research about U.S. IPOs and members learn the latest IPO research, news, market trends and industry analysis. Start with a Free Trial. This entry was posted in Stocks on March 20, 2018 by admin. Walmart (NYSE:WMT) has been chasing and emulating Amazon for way too long, and it’s only a matter of time before it really begins to weigh on Walmart stock. In the latest MoviePass news, parent company Helios and Matheson Analytics (OTCMKTS:HMNY) sold a large chunk of its new shares to cover expenses related to the troubled cinema business, playing a role in HMNY stock losing more than half its value on Tuesday. Shares of the fast-casual chain are on pace for their best quarter ever, up about 60 percent year to date and some 80 percent from the December lows. Is It Safe to Buy Biogen Stock Right Now?